After my trip from Nuenen to Detroit I suffered, as usual, from the six-hour time shift, and, in bed but hopelessly awake, I posed myself the problem, what shape a polygon with sides of given lengths would take if the enclosed area had to be of maximum value. 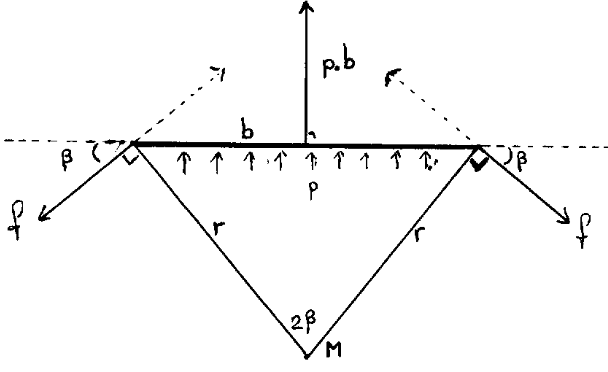 With the polygon built from rigid sides, in their endpoints flexibly joined to their two neighbours, the shape enclosing the maximum area is stable when a constant outward pressure p is exerted on all sides; hence the resulting outward force on each side is compensated by the forces of reaction exerted upon it by its two neighbours. Observing the same value f in two successive joints, and knowing the physical law “action = reaction”, we conclude that we have the same value f for the forces of reaction in all joints. In each joint the orthogonals to the forces of reaction, which have opposite directions, coincide, and from (1) we now conclude that all vertices have the same distance r from the point M . Hence we have proved that the vertices of the polygon with given lengths of its sides and with maximum enclosed area lie on a circle. Because the interchange of two neighbouring sides leaves the area enclosed and the radius of the circumscribed circle invariant, we conclude that the maximum area enclosed and the radius of the circumscribed circle only depend on the lengths of the sides, but not on the order in which these lengths occur along the circumference.